At the time of the Underground Railroad and just prior to the Civil War, The United States of America were prospering and evolving in many positive ways. Explain to your students that America was finally regarded by other nations as a strong, viable country. Beneath the surface, however, tensions were rising. Many people in the United States did not approve of slavery and the Abolotion Movement worked hard to enlighten folks. People such as Harriet Tubman also risked their lives every day to help free slaves in the South using the secret "underground railroad." Our country had been founded on the principle that every man is created equal and born with certain unalienable rights. How, though, could we justify holding other human beings captive in chains? The problem was that many, especially in the South, did not view slaves as human beings. They were considered property and thus exempt from the rights that the Declaration of Independence proclaimed. Southern farmers and plantation owners did not want to give up their slaves. The slaves were a crucial part of the Southern economy. Unit 7 deals with all of these tensions, disagreements, and events that would lead up to the American Civil War. Because the South wanted to cling to their way of life and the economic harmony that slaves provided, they decided that they did not want to be a part of the United States of America any longer. They wanted to break away and form a new, independent country. The North would have none of that. The Union must stay intact and slavery must be abolished in our day and age! The stage is set for the bloodiest and most devastating war in American History: the one we fought each other. A list of relevant terms on the Underground Railroad, the Abolition Movement, and prologue to the Civil War. An informative and detail-rich PowerPoint presentation that helps you teach unit 7 to your students. A complete set of Fill-in-the-Notes for your students. Simply print the slides (six per page) and give each student a copy so they can take notes with while you teach. 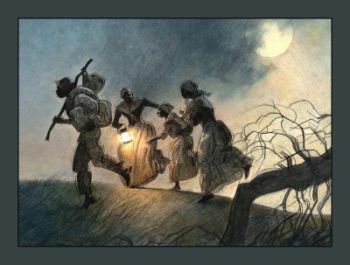 This is a great assignment to help your students understand how the Underground Railroad functioned via code phrases. A list of code words and phrases to be used with the above assignment. A reading handout that helps your students to understand what the life of a slave in America was like. Can be used as reading supplement for the group project below. This group project utilizes research skills and multimedia technology so that students understand what slavery was like in America. A grading rubric to help you grade the projects. An excellent activity to help students understand who our country's first eleven presidents were.